You saw glimpses of the dining room when I revealed the living room, so I thought I'd give you a better look at it. We renovated the dining room back in 2007 and have made some minor changes since then. 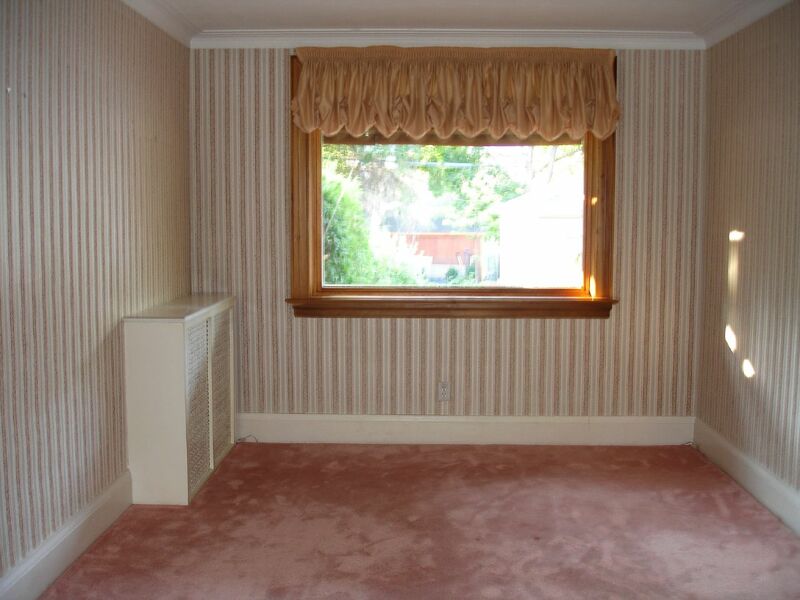 It looked like this when we bought the house - yes, another 1980's wallpaper & pink carpet special! 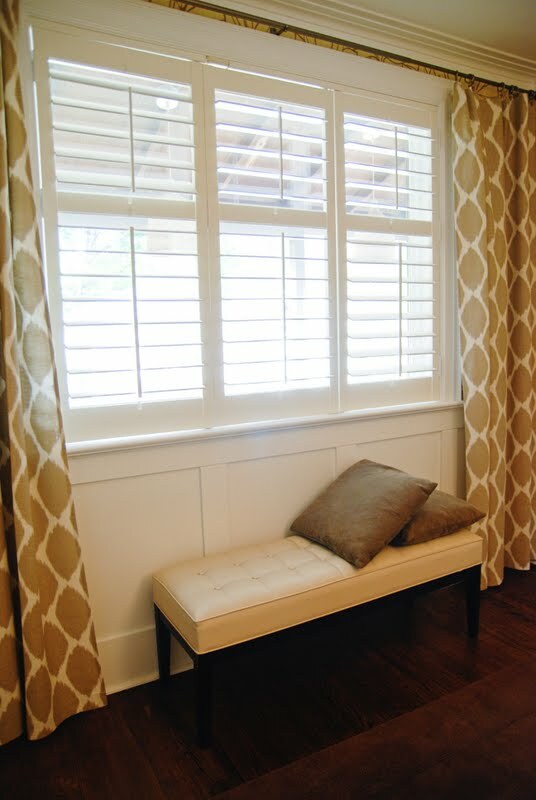 But it was a blank slate and easy enough to change with some new shutters, DIY wainscotting and bold floral wallpaper. 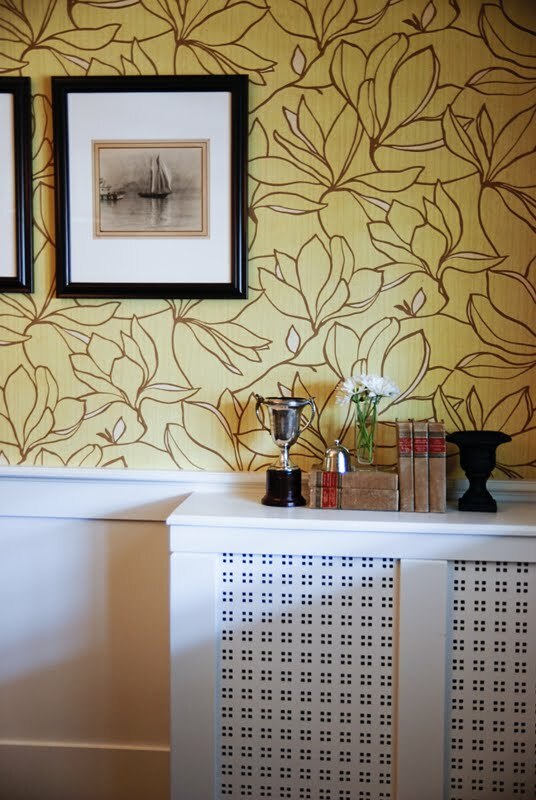 That wallpaper really gave me a headache when I was decorating the living room... the two rooms had to work together and that wallpaper had such a strong colour and pattern, it was difficult to pair it with other furnishings. In truth, if I were decorating the dining room today, I would probably have picked something a bit more subdued and classic. 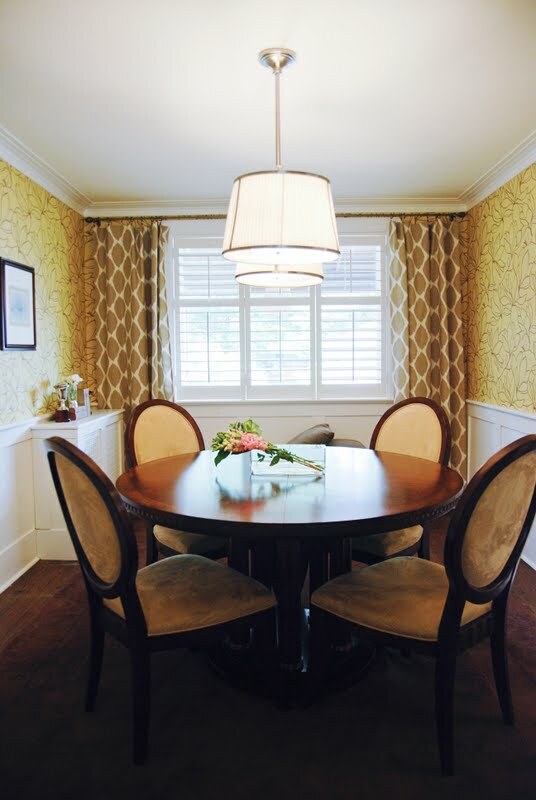 Even though the dining room and living room had to be similar, they didn't need to be the same so I used different window treatments in the two rooms. The original wheat coloured silk curtains felt boring so I switched them out for these Ikat-inspired curtains from West Elm instead. Love them, especially with the cream leather bench we have beneath the window. The bench is great for extra seating. For now, I've taken out the leaf from my dining table to make it round. It gives us more circulation space and makes the small room feel a bit bigger. Unfortunately, the double pendant light looks a bit oversized with the round table. 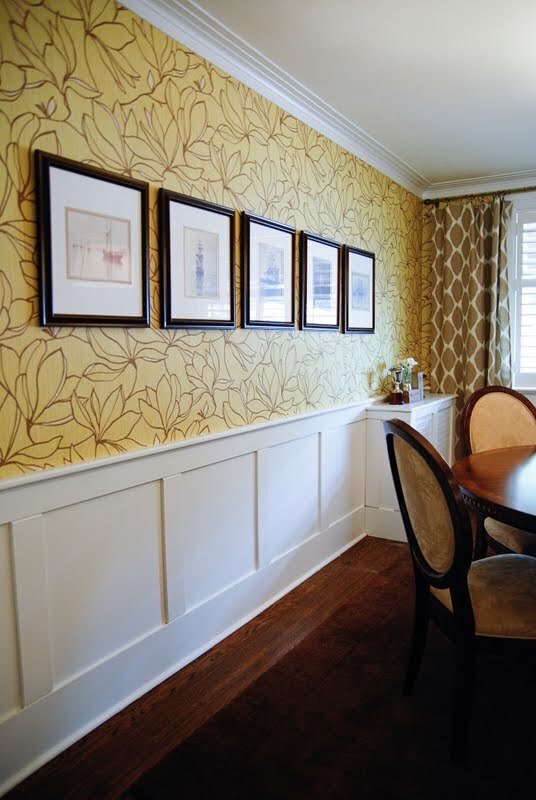 HandyMan's inherited ship prints bring some brown tones into the room. The wood of the frames works really well with the wood of my table. 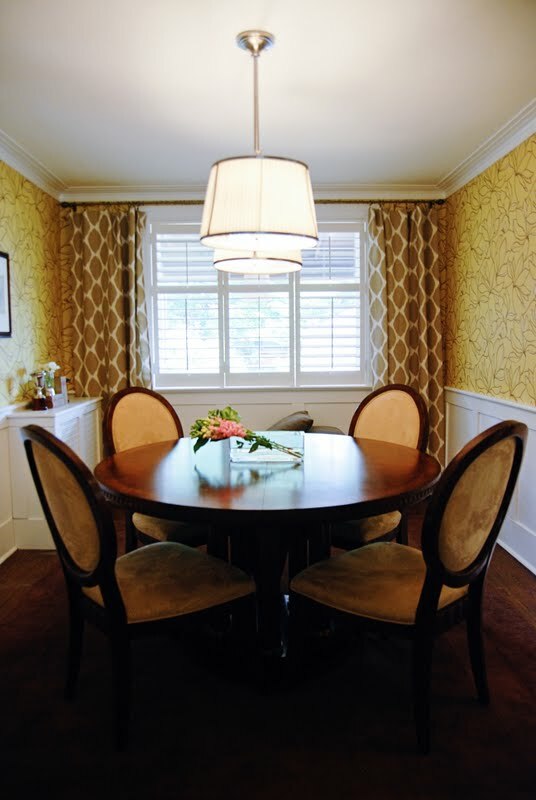 Since the wallpaper was the focus of the room, we added a plain brown carpet beneath the table. A patterned carpet would compete too much. As a bonus, the dark carpet hides all the food stains Chloe makes really well! And here in the corner is the rad box HandyMan made. I tend to use it as a sideboard during parties, putting cutlery and cups or dishes atop it. I have another little vignette there now. The silver trophy is one of my favourite recent purchases. Its from The Arthur Co.
And that's the dining room!